Hi everyone. I've just joined. I've got a VFR800 Cross runner and now looking to get a bigger bike with a similar style. I've seen the XR and it looks amazing. I would like some views on reliability. I've seen a YouTube video where a guy was moaning about things going wrong. So does anyone have experience of the XR having any reliability issues? Thank you. An honest answer, no I have not had any reliability issues. But like any other bike, little issues have occurred. On some bikes there has been problems with the Instrument panel ( Clock will not set correctly ) but BMW will change the faulty part. The bike does just about everything - from rapid road riding, carrying all the luggage when necessary - to alpine passes. Other bikes to consider would be: KTM 1290GT, Triumph Tiger Sport, and lesser-powered BMW R1200RS? But - if the ‘sports-adv’ Type of bike appeals - I’d have the XR well up the list. 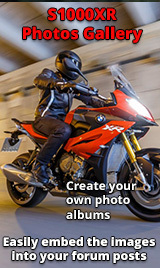 do take some test rides and whilst at the BMW shop, try the R1200RS as well. It is closer to the VFR in terms of riding position than the XR (I used to have a VFR750). I am lucky, I have an RS and an XR and whilst they have some things in common, they have very different characters when riding. I tried the Z1000SX and MT10 but the XR is the first inline 4 I have been tempted to buy this century. Their were some early bikes that had camshaft issues mostly turned up on the now defunct other site but not many and certainly nothing in the last 2 years or so. I bought a new XR in November last year, the 2018 model i believe. It developed a bad rattle in the top of the engine when i had put about 4500 mile on it. It turned out it needed a pair of camshafts due to some hardening issues in the manufacturing process. Took it back to BMW and they fixed it with no quibbles, as you would expect. About 6000 mile on it now and all is well. Absolutely no issues with my XR in nearly 2 years. Admittedly it hasn’t done a shed load of miles. Have absolute confidence in it. BMW service second to none.